The series of case studies including examples from Scotland, USA, China, Germany, England, and Iceland present the strengths of the Charrette process and show how they can be delivered on a variety of scales, sectors, and sites. 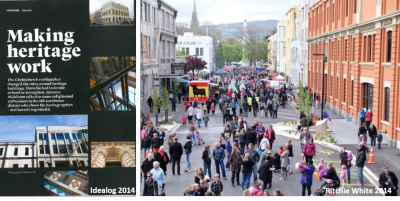 The book highlights the significant success of the Urbanismplus-led Dunedin City Central Strategy process, achieving stakeholder and council buy-in which resulted in $1.1m of council investment in grants and amenity upgrades and $52m of private investment. The book celebrates the collective intelligence of communities which brings social, economic, and environmental value to designing cities and neighbourhoods through Charette and gives practitioners and communities the inspiration and confidence to introduce Charrettes into their planning processes. Decades ago you could go floundering in the Rewarewa Stream, but it is now sadly neglected and obscured by overgrowth, with residential and commercial buildings turning their backs on the corridor. However, the severe storm events of March and April 2017, which resulted in devastating losses and damage to local businesses, have presented an opportunity for regeneration. The remediation works provide a public space above the new culvert on Great North Road. 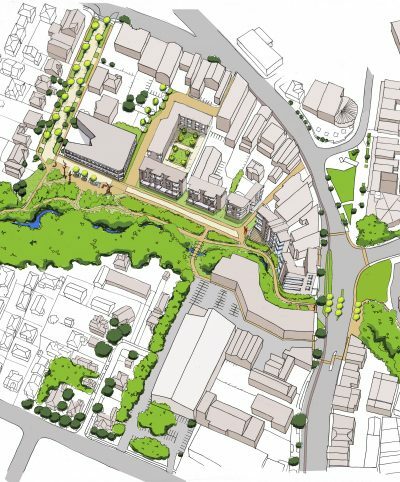 The wider regeneration framework proposes new walking and cycle links, and a new bridge across the stream. A shared street along the stream will be lined with new public spaces with art works and play elements. With new vehicle connections, and parking improvements, it is hoped that new apartments will locate along this edge to add to the vibrancy and safety of the precinct. 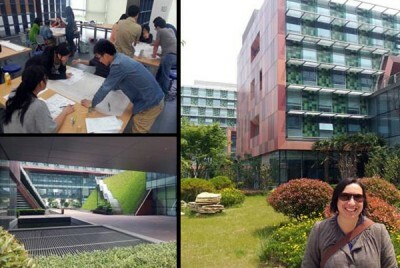 Water sensitive design will be applied, and the health of the stream will be improved. The project was led by Craig Mcilroy and Shaun Jones of Auckland Council Healthy Waters, with Craig Mountjoy, managing the culvert remediation. Kobus Mentz of Urbanismplus led the strategy and facilitated several workshops involving the Whau Local Board, land owners and numerous Auckland Council specialists. Boffa Miskell provided landscape architecture input. 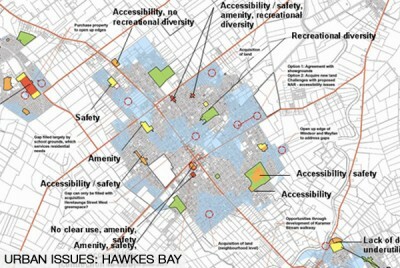 The framework has been endorsed and will be incorporated in the New Lynn Urban Plan 2010-2030. 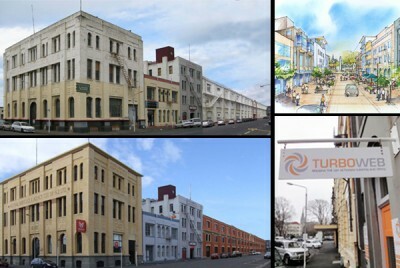 This project supplements Urbanismplus’ other natural disaster related projects such as the 2011 Lyttleton earthquake recovery plan, the facilitation of Lismore’s (northern NSW) Flood Ready Plan, and Dunedin’s Warehouse District which leverages regeneration benefits off earthquake strengthening strategies. Our transport-specific urban design approach has helped prioritise $8 billion of transport infrastructure for 30 years of growth including new town centres, residential communities, employment areas, rail stations, rapid transit networks, and cycleways. Urgency fueled by Auckland’s housing crisis required an alliance of three agencies, Auckland Transport, Auckland Council, and the NZ Transport Agency, and an intensive strategy production process, led by Urbanismplus, based around 10 workshops to develop, model, test, and evaluate some 300 transport options and programmes for new growth areas around the region. All work was in compliance with the rigorous standards of a Programme Business Case, developed by AECOM, and reconciled the diverse expectations and objectives of the three large governance agencies. Overlapping streams of consultation with stakeholders and the wider community were undertaken. Subsequently, the Programme Business Case has been endorsed by the NZ Transport Agency’s Board, Auckland Transport’s Board and Auckland Council and Detailed Business Case work is underway. Read more here. Councils and communities around Australasia are grappling with complex transport challenges which threaten to stifle their economies and weaken their communities. Typically they are either confronted with too much traffic, congestion, and harsh environmental conditions, or too few linkages to satisfy community and business needs. Yet some new processes are delivering remarkable outcomes, saving communities millions of dollars, creating new jobs, and producing safer and friendlier places. Approaches are now less traffic-centric, and traffic modelling, while important, isn’t the sole driver. Non-transport issues are considered concurrently. Solutions vary as they flow from the context and are evidence-based, not ideological. Read more in our article ‘Transport as a Tool for Transformation‘ published in Local Government Magazine and listed on our Quality page. 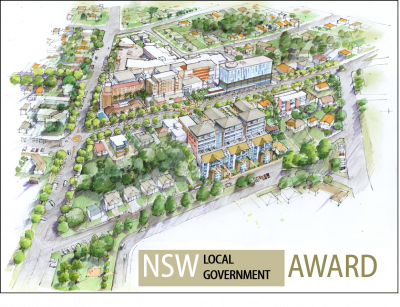 A cluster of unique Lismore City Council projects, facilitated by Urbanismplus, have attracted a prestigious New South Wales Local Government Award. Lismore Health Precinct – encompassing the Lismore Base Hospital area, the outcomes included plans for a multi-level carpark, increased housing choice for health workers, and immediate changes to improve residents experience with the hospital. Health Precinct Housing Intensification – new planning controls that facilitate medium-density housing in the precinct to accommodate health workers and clinic space for health professionals. St Vincents Private Hospital Precinct – a new development framework that supports hospital growth in a primarily residential area. Buy Local Project Northern Rivers – an online portal was developed where local businesses can be automatically notified of tenders from health services, universities, and Council, retaining thousands of dollars in the community. Subsequently, a Health Workforce Plan was developed to address the looming skills shortage in the local health sector. The award recognised this project for its excellence in cross-council collaboration, community, and cross-sector partnerships which have improved services that strengthen the physical and social infrastructure of the region. See articles outlining our award-winning processes here and here. The nexus between urban economics, urban design, and the politics of local governance is seldom understood. 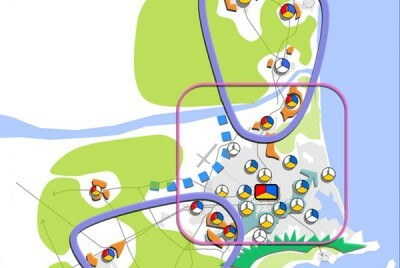 Economic strategies often lack a spatial (place-based) dimension, as much as urban plans often lack an economic logic. These inter-relationships are important if we want our cities to be more efficient and our communities more equitable and prosperous. In addition, sustainability imperatives demand we deliver more with fewer resources. With the ever-present need to do more with less resources, Council’s across Australia and New Zealand are working innovatively to find new ways to leverage off, and partner with, external organisations. In some cases the savings could be in the millions. Urbanismplus have helped to drive innovation in this area over the last 5 years, radically changing the way some councils do business. Projects include development contributions policies that promote residential and business growth, and innovative techniques that unlock infrastructure and planning constraints to enable growth, anticipated to bring jobs, growth, and millions in retail spend to CBDs. Lismore City Council (LCC) was recently awarded the ‘Excellence in Innovation’ at the Northern Rivers Business Awards for their ‘Buy Local Project’, developed in a process facilitated by Urbanismplus and championed by LCC Executive Director, Brent McAlister. The project, a partnership to develop an online noticeboard for Northern NSW Local Health District and University Centre for Rural Health to easily source products and services locally, was enabled by LCC facilitating the website development. In just the past month the website has allowed local businesses to directly access 50 tenders, with an expected contract value of AUD$30 to 50 million. More institutions have subsequently come on board. Fore more information on our defrag and leverage techniques, visit deFRAG. 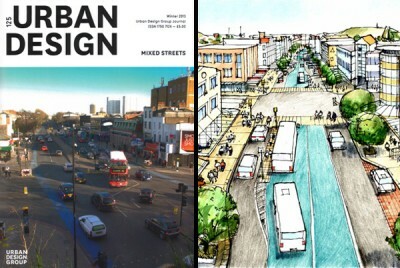 Kobus Mentz is the urban design expert advisor to the government on their new capital plan which is being delivered through the Urban Planning Council by Arup and Larry Beasley Associates. 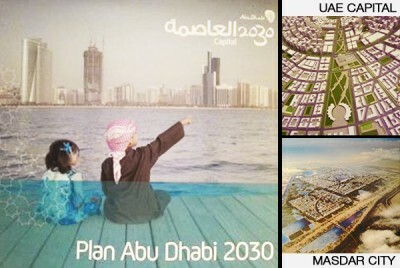 The extent of the future city is larger than Paris and encompasses high profile components such as the new capital complex, Jean Nouvel’s new Louvre Museum, Frank Gehry’s new Guggenheim, Zaha Hadid’s Performing Arts Centre, and Foster’s Masdar City – the world leading sustainability exemplar that is being modified for commercial viability. The shift entails substantial new transport orientated developments around extensive heavy and light rail projects, new industrial employment zones and new-economy precincts. New environmental and social standards build on the internationally awarded Estidama design, construction, and operational sustainability rating system. The plan is being delivered through a series of workshops with over 30 government agencies and 15 major developers. Outputs include a 2030 Strategic Growth Plan, policies, an Implementation Plan, and a Capital Investment Plan. Creative industries initiative generates employment in Dunedin’s historic ‘Warehouse Precinct’. 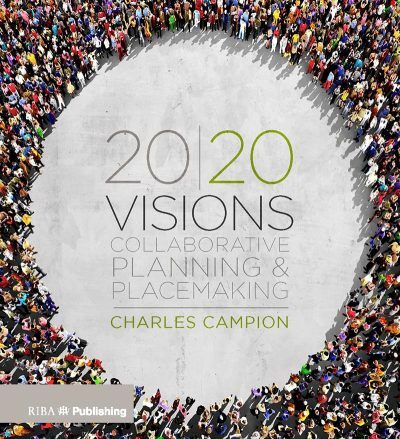 “This project successfully offers an inspirational vision and incisive strategic plan that illustrates urban design’s relevance in these challenging times”. The project’s high quality public engagement, integration between disciplines and urban economics emboldened Council to fully endorsed it and vote $500,000 of early funding for physical improvements, in addition to $70,000 of incentive funding for a re-use grants scheme. A total of 11 projects were supported through the re-use grants scheme for a range of works including earthquake strengthening and façade improvements. This included the protection of a building that was at risk of demolition. Five new businesses, some of which are entirely new tenants to Dunedin. Commencement of a hotel development and car parking building which has been on hold for more than 15 years. Two new apartment complexes (with more than 15 apartments) which will attract new residents to the area. A building that was vacant for ten years now tenanted. A pop-up theatre located in a rescued building. Tenancy negotiations underway on two other buildings for new cafes and retail premises. Is Urban Design a Universal Language with Local Dialects? Kobus Mentz delivered a number of key-note lectures and studio visits at six universities over just two and a half weeks in China, Africa, and Australia, before stepping into the Auckland urban design masters studio the day after his return. These institutions are all grappling with significantly different cultural and economic challenges. In China the uppermost issue is designing for rapid urbanisation and addressing the social effects. Many areas have up to 75% newcomers within just a few years. Locals are swamped by workers from distant regions creating tensions and a loss of identity. New Zealander, Dr Becky Kiddle (pictured left) is doing great work in this area on the urban design course at Xi’an Jiaotong-Liverpool International University in Suzhou, outside Shanghai. In Africa (Cape Town, Johannesburg, and Pretoria), in addition to some inner city designs, the focus is on improving the quality of life in squatter settlements and townships. Emphasis is on the very basics of life such as shelter, health, education, safety, employment, water quality, and environmental conditions. CUSP (Curtin University Sustainability Policy Institute) at Curtin University in Perth are busy advancing research and theory on sustainable transport, climate change, democratising public engagement, and much more. In Auckland there is current emphasis on how to implement and make good urbanism viable, housing affordability remains a challenge. While the issues preoccupying these universities vary substantially there are surprisingly high degrees of commonality in approach, their designs and master plans even look remarkably similar. They all seem united in their quest for efficient urban solutions which offer choice and diversity, safety, high quality amenity, employment futures, and kinder responses to nature. The variations seem to be differences in emphasis rather than the absolute absence of one or other of the triple bottom line issues. Biodiversity and water quality concerns, for instance, seem deeper in Australia and New Zealand than in the developing countries, possibly an indication of more pressing social and economic needs. How sound economics can be achieved by combining selective austerity measures with selective strategic investment. Why integrated approaches are required within local government if more efficient integrated environments are to be delivered. How ‘leveraging’ off external entities can achieve substantial community benefits with less resources. Only then will politicians make more consistent and unbiased decisions. To be durable these processes should be ‘bottom-up’ in that they understand local and place-based issues before considering organisational and budgeting responses. They should also be ‘inside-out’ and work with council staff to addresses internal disconnects before considering external strategies. 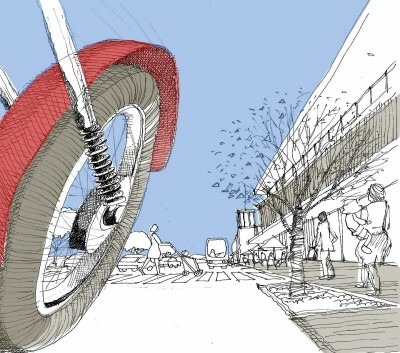 These methods have been developed and applied by Urbanismplus in Australia and New Zealand. See Local Government Magazine for the full article, and also see earlier article, by Kobus Mentz and Susannah Goble. 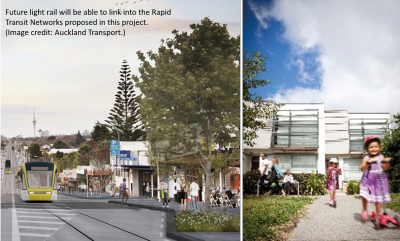 The Liveable Arterials Plan is New Zealand’s first network-wide transport plan based on an urban design-led process. It was developed to address the spatial and financial challenges facing Auckland’s arterial road network. The Plan sets out a 25-year framework for the innovative management of arterial roads in the city based on integrated design, to balance transport models and fixed engineering standards as the primary shaper of road space. 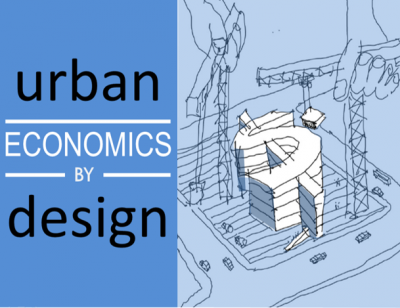 The urban design process used to develop the Plan, led by Urbanismplus was anchored around a series of inquiry-by-design workshops informed by issue-specific research. The process led to significant buy-in and acceptance among participants of how integrated the issues were, breaking down traditional silos. Outcomes and innovation were produced that otherwise would not have arisen. 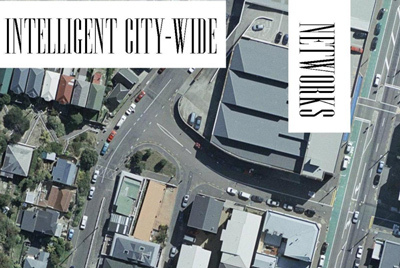 We discuss the process in more detail and outline the lessons learnt in our article ‘Liveable Arterials in Auckland City’, published in Urban Design. I identified Middlemore as a strategic site for intensification, in the context of the Auckland Spatial Plan’s intensification strategy. It is well connected and the adjacent Greenfield site (previously a golf course) provides opportunity for development. I proposed a bio-medical focus, building on the existing major teaching hospital and employment anchor. The aim is to create a pedestrian focused Transport Oriented Development anchored around Middlemore Hospital and the new Bio-medical Research and Development Centre. It is designed to be a self-reliant and dynamic urban neighbourhood, connected through an extensive public transport network, and provide a mixed use of areas for people to live, work, and play. Following group work to develop a regional growth strategy I undertook detailed studies of the Manukau City/ Wiri area to determine how the growth strategy could be implemented at a local level. These studies were refined to work at a precinct scale of selected masterplans around the Onehunga basin, identified as a key area for managing Auckland’s growth aspirations. For the final project, I prepared a detailed Masterplan as part of a wider redevelopment of Middlemore Golf Course. A key driver was the relationship between residential density, amenity, and the economic viability of urban intensification. 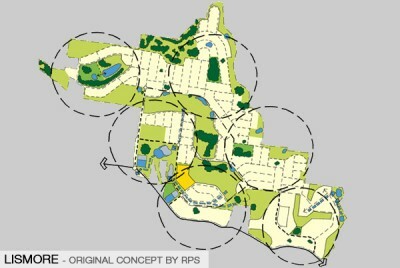 In developing my final precinct masterplan, quality open space, and the enhancement and expansion of natural networks into the urban environment were critical elements used to achieve a more compact and economically viable urban environment. See article: ‘Earning the Profession’s Respect’ as published in Landscape Architecture New Zealand, Summer 2012. 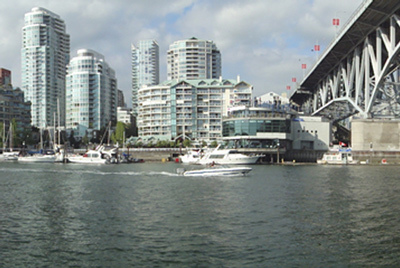 A formal link between the University of Auckland (UoA) Masters of Urban Design and the University of British Columbia (UBC), Vancouver has been established. The relationship was initiated by Kobus Mentz and secured by Prof. Errol Haarhoff, Prof. John Hunt and, Lee Beattie, Deputy Head of Planning Programmes at UoA, and cemented by a joint studio project in Vancouver this year. 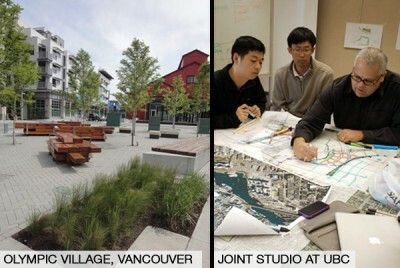 Kobus used established relations with Larry Beasley (celebrated former director of planning at Vancouver City), and Scot Hein (Chief Urban Designer, City of Vancouver) to approach Prof. Penny Gurstein, Director of the Department of Planning and Community Development at UBC. The studio of 21 students was run by Larry with the assistance of Scot (pictured), Brent Toderian (practitioner) and Maged Senbel (UBC urban design programme leader) as well as Errol, John, and Lee from Auckland. The project area centred on False Creek, which was home to the Winter Olympics Village, a world class exemplar of sustainability design. Future joint studios are being investigated. Lismore Council have undertaken a series of dramatic initiatives to enable housing choices in its city that will retain high earning individuals, attract others who will create new businesses as well as deliver a component of affordable housing options. This could mean up to $50 million additional local retail expenditure and over 1,700 jobs in the North Lismore Plateau Growth Area alone. A council-based process, driven by Kobus Mentz, was used to compress months of work, decision making, and programming into a very short space of time. This new approach uses a series of highly structured two-day work sessions involving land owners, their consultants, all relevant council staff, and the elected members. Specific outputs are relentlessly pursued such as headline agreements around design quality, housing diversity and affordability and environmental standards. Commitments from both sides of the table are made around infrastructure provision and programme. Christchurch City Council and Urbanismplus have received the NZPI Best Practice Award: Consultation and Participation Strategies for the Lyttelton and Sydenham Master Plans. The Lyttelton and Sydenham commercial centres were seriously damaged during the series of earthquakes in 2010 and 2011. 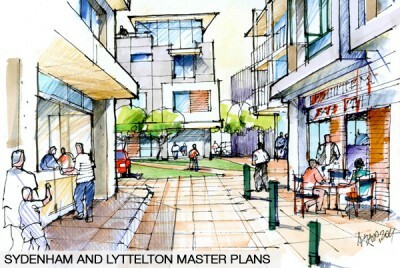 A custom-designed consultation process was developed to produce the Sydenham and Lyttelton Master Plans that reflected the unique time constraints and resources of the Christchurch City Council and its communities in the post-disaster environment. The process included, site visits with community leaders, issue specific focus groups, meetings with project stake holders, public feedback presentations and pre formal consultation submission opportunities. The Master Plans are a significant step in the recovery and regeneration of these two damaged centres. The Plans have addressed urgent core elements in the centres and provided emergency solutions to address the community’s needs in the context of a clear long-tem plan. The Awards Panel commended that the approach taken in the Plans, where principles and possibilities were formulated to act as a guide, as opposed to providing only fixed-solution concepts, allows for adaptability that responds to community feedback and economic opportunities. 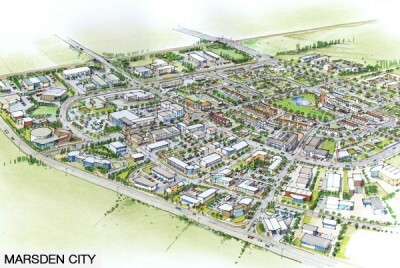 The creation of Marsden City, to be developed in Ruakaka as New Zealand’s newest city, has been given the go-ahead. 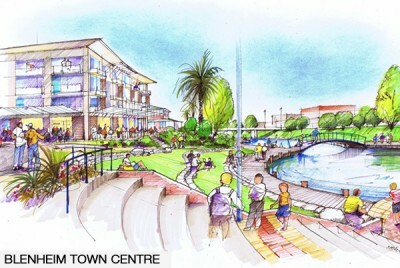 “The Environment Court has cleared the way for the development of a mixed-use town centre that, under the Whangarei District Council’s structure plan, envisages a population growth of up to 40,000 within the next 20 to 30 years,” says Oliver Scott, director of North Holdings Group, which is undertaking the Northland development. Urbanismplus have Master Planned the mixed-use development that includes a retail shopping centre, commercial businesses, parklands, industry, and residential choices including detached and medium density houses most located around a series of neighbourhood parks. Scott says the vision is for “city space designed for relaxed, community-styled living, built around open recreational space and a vibrant city centre”. Marsden City will deliver a significant boost to the region’s economic growth. In addition to plans for retirement, education, and retail there is interest from a large global cloud-hosting data centre that could create up to 1000 jobs. Scott says a $500 million refinery expansion announced by Refining New Zealand will create more than 350 new jobs. In the February earthquake, 64 commercial centres in Christchurch City suffered damage and disruption. While the Central City is being addressed through its own planning process, a different model is required for suburban centres. Timeframes are shorter, community expectations are heightened, and issues are more urgent. 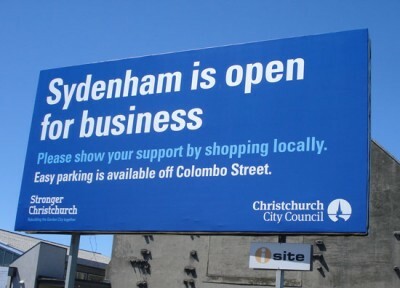 Two of hardest-hit centres – Sydenham and Lyttelton – serve as demonstrations for the recovery and regeneration of other local centres. This process is being led by Kobus Mentz and his team. Over a short period they consulted with over 500 stakeholders – a rate unprecedented for many New Zealand communities – and prepared draft Plans with supporting implementation actions. Pinpoint early measures that provide immediate support to vulnerable businesses and people. Use empty ground for temporary landscapes. Find homes for displaced community activities. Embrace unique post-disaster regeneration opportunities. Look to strengthen the community’s disaster response in possible future emergencies. Recently the Urbanismplus team presented back to over 800 people who gave majority approval to the proposed actions. Formal consultation on the draft Master Plans is now underway. See article: ‘Need-To-Have trumps Nice-To-Have’ as published in Planning Quarterly 2011. A second major win for this project which was conceived in 2004 by a unique client/council/consultant team led by urban designer Kobus Mentz, now director of Urbanismplus and supported by TTM, Prosperous Places and Urbacity (then Patrick Partners). University Hill was been declared the 2011 ‘Best Master Planned Community’ in Australia at the Property Council’s national Innovation and Excellent Awards ceremony on 14 May 2011. The mixed-use development is being delivered by MAB Corporation at Bundoora, City of Whittlesea. It contains over 1,000 new homes and incorporates significant commercial and industrial uses, offering local employment opportunities successfully integrated with residential, retail, recreation and community services and facilities. 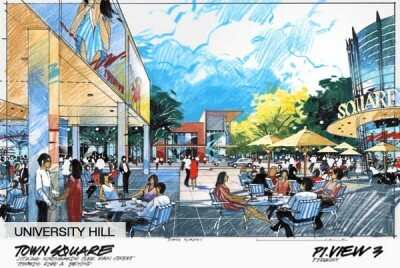 The integration of such a large scale of employment within a mixed-use community has resulted in University Hill being repeatedly described as a ‘unique’ development. 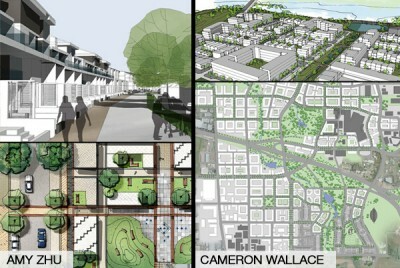 2005 Planning Institute of Australia’s Award for Planning Excellence in Urban Design – Plans and Ideas. Marlborough District Council and Urbanismplus have received a Nancy Northcroft Planning Practice ‘Highly Commended’ award. The ‘Growing Marlborough’ strategy, managed by Wayne Bredemeijer, is an industry-leading growth management approach for non-metropolitan areas. The Marlborough District is composed of many small settlements, each with unique opportunities and limitations. A number of District-wide issues are also evident, particularly around infrastructure and economic development planning. 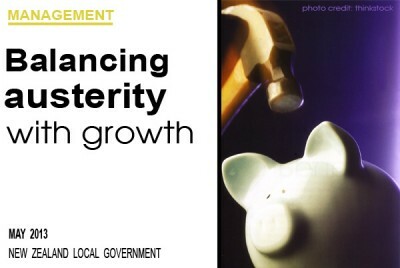 Growing Marlborough is a unique bottom-up growth strategy, based on detailed investigations of 19 settlements across 6 major multi-disciplinary workshops from 2008 to 2010. Over 1,000 public and stakeholder attendees were directly involved in guiding the issues identified, concepts tested, and outcomes prioritised. The ideal outcomes for each settlement and local networks of settlements were then revisited from a District-wide perspective and process of internal alignment. 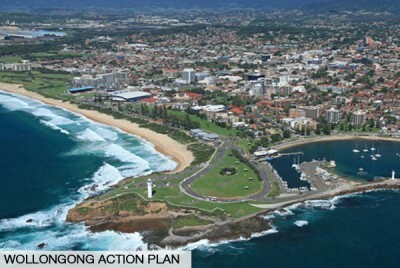 Wollongong’s position as the capital of the Illawarra Region will be substantially strengthened by its new Action Plan for the CBD. The plan lays out future priorities and includes costs, timelines and responsibilities. It pulls together over 60 projects, including business retention, investment attraction, streetscape and public space upgrades, a focus on building quality and traffic improvements. 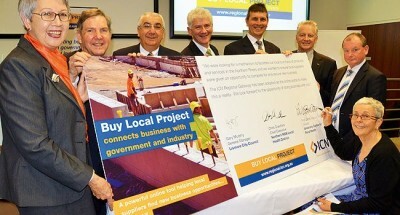 The plan has the buy-in from major stakeholders, such as business owners, property developers and the local community. The catalyst of the Action Plan was a series of strategic sessions in late 2010 run by Kobus Mentz, Wayne Bredemeijer, and the rest of the Urbanismplus team, along with Mike Cullen of Urbacity. Designed in 2004 by a team led by Kobus Mentz, University Hill has been awarded the 2010 ‘Master Planned Development Award for Excellence’ by the Urban Development Institute of Australia – Victoria (UDIA). 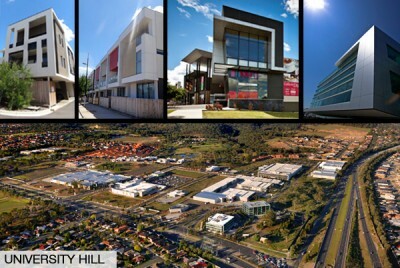 University Hill is a comprehensive mixed-use development at Bundoora, City of Whittlesea. Located next to RMIT University, this project is developed by MAB Corporation. Other team members were TTM, Prosperous Places, and Urbacity (then Patrick Partners). The focus of development at University Hill was employment creation. By designing a town centre with retail focused around the public realm, substantial medium density housing provision and a range of high quality residential accommodation options, all elements work together to attract employment creators. The mixed business and industry precinct, one of nine, will consist of a range of affordable industrial and office spaces and its proximity to RMIT supports the development of technology and knowledge based business opportunities. UDIA describes University Hill as a “fully integrated mixed-use community” that creates a “unique living environment”. Urbanismplus’ action plan pulls together a complex range of existing and new educational, health, employment, housing and social support initiatives for the Tamaki Transformation Programme – the only urban regeneration project of its kind in New Zealand. Economic analysis estimates the Development Plan will grow New Zealand’s GDP by $2.0 billion (1%) and directly support 20,700 jobs over 30 years¹. The 20 year Plan delivers on central, regional and local government priorities and delivers a strategic sequence of spatial and non spatial initiatives. Innovative foundation period projects include pathways to health sector careers for Maori and Pacific residents, a technology-based learning network for children, and state housing renewal demonstration projects. At the heart of the strategy is a redeveloped people’s park and living precinct. A community service hub serves as a catalyst for private sector participation and regeneration. The Government has committed to multi-sector and community collaboration to deliver change in Tamaki. The Plan defines stakeholder and agency roles to ensure effective implementation. Significant work is being done in high profile urban areas, such as city centres, waterfronts and new planned settlements. However, there is little theoretical or practical knowledge being developed to direct place-specific growth in the vast in-between areas where many people live and work. Achieving sustainable urbanism in suburban areas and small settlements, where limited public sector investment is available and market forces are weak, requires well-tested rather than trend-driven responses. In mid 2010 Kobus Mentz delivered a presentation on his “Everyday Urbanism” practices as part of the “Cities Programme” at Simon Fraser University, Vancouver. The presentation focused on sharing tools and techniques for delivering small interconnected spatial and non spatial initiatives across the city and the in-between spaces in the city. The first anniversary of the signing of the China-New Zealand Free Trade Agreement was marked by the International Sustainable Cities Forum, held in Auckland in early 2009. The Forum invited 50 senior business and government leaders from China to meet with their New Zealand counterparts. Delegates came together to look to develop commercial and business opportunities within New Zealand, with a specific focus on sustainable development. The Forum involved a programme of presentations by New Zealand business and development sector leaders, including the Minister of Internal Affairs and the Mayor of Auckland City. 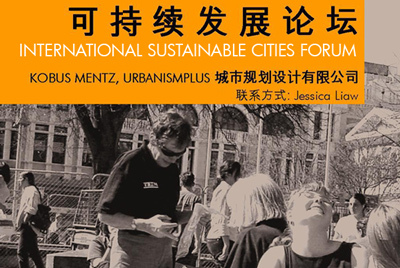 Kobus Mentz was invited to speak on Urbanismplus’ sustainable urban growth planning practices, presenting demonstration projects from New Zealand, Australia, China, India and the U.K. 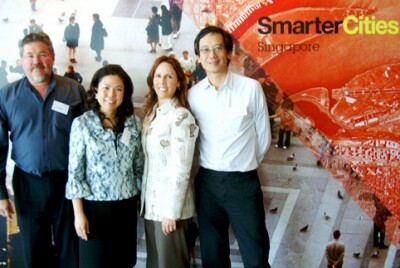 In 2009, IBM ran three international Global Innovation Outlook think-tank events. The events brought together leaders from the fields of policy, business, research and the third sector to jointly consider issues affecting our world today. Kobus Mentz joined 30 other selected specialists at the Asia / Australasia event to discuss sustainable practices that would address water, healthcare, energy and economic development challenges. The event was set against the backdrop of Asia urbanising at a rate of 100,000 per day, which is equal to the creation of seven New York Cities a year. 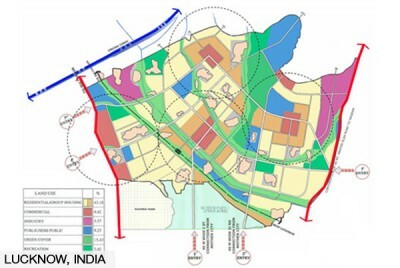 In 2008, Urbanism+ worked with Woodhams Miekle Zhan International to conduct an Urban Design Review of the Concept Plan for Lucknow, the capital city of the state of Uttar Pradesh, in Northern India. The review highlighted opportunities for improvement of: the movement network – to increase legibility and connections; the open space network – to provide an integrated series of open spaces and clear drainage pathways; the pattern of land use – to provide a balance of employment, living and recreational opportunities. Urbanism+ proposed a series of initiatives that improved the development efficiencies and urban economics, consolidated the open space areas to form a meaningful open space corridor, lined high amenity areas with high density group housing, and supported the movement networks with visual links to ensure that travel is direct and easily understood. The 2009 International Cities and Town Centres Society’s (ICTC) annual conference provided a platform for recent experiences and new ideas to be shared amongst the built environment. Kobus Mentz presented a paper titled “Intelligent City-Wide Networks”. The paper outlined new techniques to enable all disciplines to meaningfully participate in the creation of inclusive transport networks. The methods presented demonstrated how to balance tensions commonly evident between the quality of place and through movement, arterial routes and land use interface, passenger transport, general traffic, freight vehicles, pedestrians and cyclists, and economic, cultural, and environmental issues. In order to protect the fertile and highly productive land surrounding Hasting’s CBD, the town has recently tackled the need for intensification of its town centre. In 2009/10 Urbanism+ worked with Hastings District Council to develop a strategy for the future of the CBD and its wider urban areas. 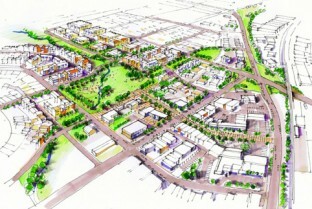 The resulting initiatives included a proposal for a series of open spaces throughout the CBD, methods for capitalising on the movement economy within the area and the development of a robust position for Hastings within the District’s Transport Strategy and Heretaunga Plains Growth Strategy. The project was delivered over a very short period with high staff involvement and community support. With a population of approximately 374,000, Al Ain is the United Arab Emirate’s (UAE) second largest city, after the capital Abu Dhabi. In 2009, Larry Beasley, special advisor to the UAE Urban Planning Council, led a design charrette to develop plans and strategies for the growth of communities surrounding Al Ain. 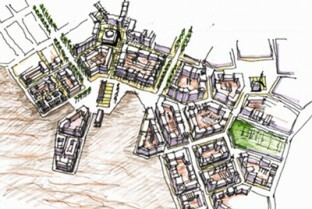 Kobus Mentz was invited to join the charrette to lead the design of a new town at Al Hayer. The design is a contemporary interpretation of the middle eastern social logic around ‘fareeqs, barahas and sillas’. It also responded to the extreme heat and water scarcity faced by the region and its aspirations for energy efficiency. The ‘Partnership for Urban South Hampshire’ (PUSH), is a collaboration between the eleven local government authorities in South Hampshire, England, who, together with government and local organisations, are working to promote sustainable, economic-led growth and regeneration for their region. In early 2009 Kobus Mentz was invited by the South East England Development Agency (SEEDA) and the UK Commission for Architecture and the Built Environment (CABE) to contribute to PUSH’s ‘Design Action Plan’, which was developed to guide the growth predicted for the sub-region. The Greater Christchurch Urban Development Strategy involved a spatial planning component, completed by Urbanism+ in 2008. It has been used by The Commission for Architecture and the Built Environment (CABE) as a demonstration model to help urban designers in the UK achieve outstanding sub-regional planning and urban design. CABE was set up in 1999 to provide expert independent design advice to architects and urban designers in order to improve the quality of design and development in the UK. CABE’s role is to help public agencies commission better design – design which is functional and sustainable and which delights people – and to provide guidance and practical resources to urban designers contractors, architects and planners involved in creating towns and cities.